With RootsTech 2013 only a few short weeks away, I thought I’d share some tips for attending the conference. Choose your sessions wisely. Pick topics that will enhance your knowledge or that pique your curiosity. Choosing topics you already know a good deal about isn’t a bad thing (hey, we can all use a refresher), but if you could be the presenter for the topic, use this opportunity to learn something new. Arrive early for those sessions! Venues have strict codes they have to follow regarding room occupancy. Once it’s full, it’s FULL! If the room monitor says it’s full, please listen to them and find another session. Arguing with the room monitor only prevents the session from starting on time or distracts the speaker and audience. Bring business or “business” cards. I realize not all genealogists who attend conferences are professionals, hence the reason one instance of the word business is in quotes. In my opinion, all genealogists (professional or not) should have a card that can be handed out when attending conferences (or visiting libraries, archives, etc.). The “business” card would list your name and contact information; mine also includes a listing of my high-priority surnames on the back. See my post Genealogy Business Card for more information and an example. Use your down time to visit the exhibit hall. This is your chance to explore vendor products and services firsthand. And don’t just stop by a table and pick up everything; say hello and engage in small talk…you never know when that contact will come in handy. Network! This is probably one of the most important things about attending any type of conference, but for genealogists, it’s also very personal. 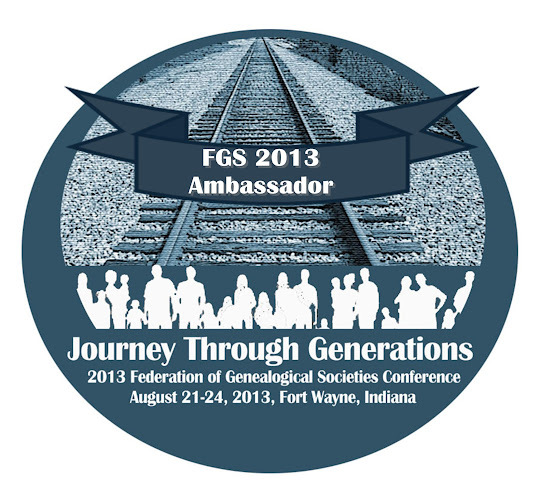 While you’ll want to network with professional genealogists and vendors, it’s just as important to converse with everyone you run into…one of those people could hold the key you’ve been looking for to unlock that brick wall. Attend social events. Although many people view social events (meals, special events, etc.) as networking opportunities, they also allow you to kick back and relax a bit from all the hustle and bustle of the conference. I’m attending the comedy night event, even though I could use that time to go to the library…since I’ll be in SLC all week, this will be a well-deserved mid-week break. Dress comfortably. Temperature control always seems to be an issue in large venues, so be prepared by dressing in layers. And don’t forget comfy shoes! Sit by people you don’t know. How can you meet new people when you hang out with your comfort group? View this is a learning and networking opportunity. Bring your tool kit. Be sure you have pens/pencils, highlighters, paper/notepad, laptop/tablet, and camera. Do some research. RootsTech 2013 is held right by the Family History Library. Even if you are not arriving before or staying after the conference, you can still find some time to pop over to the FHL for some research. In fact, the library is open until 9pm on Tuesday-Saturday (5pm on Monday), so you’ll be able to grab a bite to eat after your sessions and spend the evening in the library. And, as a bonus, the library will be open until 10pm from the 20th to the 22nd (Wednesday, Thursday, and Friday) because of the RootsTech Conference. So bring your research toolkit and to-do list. Need some guidance? See Planning a Trip to Salt Lake City for Your Family History Research. There are plenty of other tips out there, but for me, these are the big ones. Feel free to post your own conference attendance tips in the comments of this post. Haven’t registered for RootsTech 2013 yet? There’s still time! Head over to the RootsTech website to register today!! Great tips Julie, thankyou. See you at RootsTech. Thanks, Alona. Unfortunately, I will not be able to attend the conference this year. But I'll be there in spirit! looking forward to meeting you in SLC!